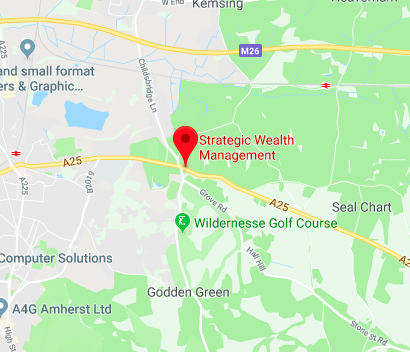 To explore how Strategic Wealth Management can help you and your family or to arrange an informal coffee and chat, please enter your details below. Note: Guidance on this website is subject to the UK regulatory regime and is therefore restricted to consumers based in the UK. Our offices are located in Seal, off the A25 at the top of the High Street as you approach from Borough Green. As you drive through the gates and down into the car park you will find our parking on the left hand side at the bottom of the stairs. Walk up the stairs and you will find our office located at the top, to the left hand side. The nearest train station is Sevenoaks. As you come out of the station there is a Taxi rank to the left. The journey to our office will take no more than 10 minutes.